Submitted by Edward Revy on April 22, 2007 - 10:08. Be prepared to watch the price constantly. Monitoring the price is not an easy job. Trade the most active hours – London and New York. SAR defines whether we go short or long. We will take only one type of trades according with SAR signals. When we talk about “trend change” we mean small tiny trends that are actual for us scalpers on 5 minute chart. We do not want to know what is going on 15 min, hourly or even more so daily chart. 1st order – close in 5 pips and later constant re-entry-scalping with rules described below. 2nd order – close on 14th (or 18th) SAR dot (whichever SAR got first 14 dots – just count them) – this gives us some relief that we have scored something. Also you may not wait till certain number of dots and just close second order where you fill it is a good gain to secure. Another option: if you are familiar with waves and know what price retracement means, look to close 2nd order after the first, at most second clearly noticeble retracement and once the price has recovered and gave a strong move forward. 3rd – this order remains open and it is our constant relief that we are always earning something as long as both SARs are in agreement that the trend is alive. We close 3rd order only with the first SAR dot (any of 2 SARs) appearing on the opposite side signaling of a reversal. Or if you feel it is enough for you – do not hesitate and close it earlier! We trade both currency pairs at once. In total we run 6 open orders maximum. EUR/USD and GBP/USD have over +90 in correlation which means they move simultaneously almost always. It helps to anticipate good or bad signs watching two pairs at once. If with the first “trial” entry we have loss, open next “trial” position only when both SARs have agreed on the trend. (You may always wait for 2 SARs to be in agreement before entering any trade, but then sometimes you will miss most of the price move). Now let’s move to our order # 1 which is going to be reopened to scalp the market with 5 pips in profit. Stop loss will remain -12 pips. Profit target +5 pips. Once hit 5 pips and we are on the same candle (price bar) set limit order on the same candle half way from the current price (this is not to be calculated, just approximately, also you may check previous candle extremes and set order accordingly). In other words, “half way” means half of the candle’s current body while the candle continues moving up and down). So, set half way below (for uptrend)/above (for downtrend) the recent price – what we want here is for the price to pull back, fulfill our order and bring us another 5 pips on the same spot. If it does not retrace – we will not worry as we have our two other orders gaining profits for us. If a new 5 min candle appears, then project (visually) possible future retracement/pullback close to 8SMA and set limit order there – in other words, make your limit order “sit” on the tip of 8EMA line). Reposition your limit order with each new candle. Now let’s play around 8 SMA. The price really “knows” this SMA. a) If most of the candle has closed above (uptrend)/below (downtrend) 8 SMA for the first time – buy/sell accordingly. ...And wait for the same MACD’s histogram to go below 0 line with the new candle and create a sharp turn (usually) or a rounding turn (not often). Enter on the close of the current candle after the sharp or rounding turn is spotted. c) Constantly watch the price approaching SAR dots as once they meet – SAR indicator will signal for the change of the trend with the new dot not matter what, therefore if spotted – prepare to exit – do not wait for the SAR as it will redraw signal only in 5 min interval – valuable time can be lost. 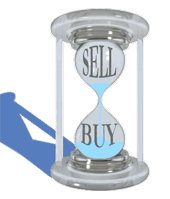 Instead watch the price, find the best “offer” and exit early with minimum loss. 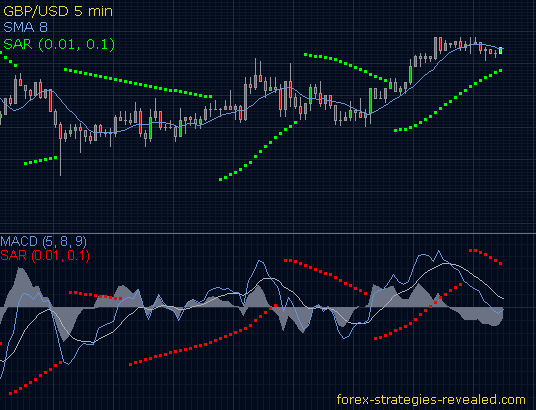 If one currency pair is showing change in trend – e.g. got signal on SAR indicator, but the other does not – exit on both anyway. Pairs move simultaneously. So the other reverse signal is on its way to appear. You may find at times that EUR/USD pair usually moves slightly ahead of GBP/USD. d) If the price for the first time has breached 8 SMA and closed on the opposite side – start watching closely the next 3 candles: if it comes back, closes on your side and goes in your favor – OK, but if price comes back, closes on your side and soon after goes and “attacks” 8SMA again and closes on the opposite side – exit with all you orders at the first suitable moment, because it is a strong (about 80%) sign of the trend reversal. If two SARs are in disagreement – stay out. Once both are telling the same thing – get in. Submitted by User on July 28, 2012 - 07:44. Submitted by Jeff on July 19, 2011 - 10:22. How do you place mutiple orders simultaneously with MT4? Submitted by winny on April 1, 2011 - 16:33. Submitted by User on September 27, 2010 - 04:30. Submitted by User on July 12, 2010 - 02:35. Thanks for the effort to get a MACD Parabolic SAR. I have just downloaded it to try. Submitted by User on June 1, 2010 - 10:59. Submitted by User on April 7, 2010 - 20:39.
this strategy works well on the 1 minute chart. Just make sure you scalp a few pips. you will have a high success rate. I've tried it on the Eur/Usd and Gbp/Usd with good results. And better yet, you don't have to spend a lot of time in front of the computer. Once you get 10-20 you're done. And all it take is maybe 90 minutes. Submitted by Edward Revy on March 6, 2010 - 04:38.
thank you for your feedback. You've got rational thoughts: we could try working with other signals on MACD, where SARs are not supported. At the moment, however, I'm not ready to dive into the new research for an alternative indicator; possibly, Alex, our scalping fellow, can try to elaborate on it. Submitted by User on March 1, 2010 - 23:43. Submitted by Edward Revy on February 23, 2010 - 14:27.
thanks a lot for a useful feedback! We so much need such comments here. Great one! So, the only way is to employ some demo MT4 with the simple SAR alert. We have a Forex forum, where you can always start a new thread, and find many good people as well as new ideas. Submitted by User on February 23, 2010 - 10:39. I love this strategy and have traded it with much success for almost 9 months now. Two points: I typically set a risk reward ratio of 1:1 or better. Example - If the distance from my stop and the candle when the trade is placed is 10 pips I look for a take profit of 10 pips, or at least move my stop to there once it is reached and exceeded. The reason is that a lot of times in a non trending market you will get profit of 10+ pips just to have the market come back and stop you out for a small loss, gain or breakeven. Another strategy I use is in a strong move I’ll wait for a "cheaper price" that is to say I’ll wait for a pull back closer to the sar dots. This way my risk reward is very attractive. Lets say initially the distance between the sar and candle is 10-15 pips, by waiting for a pull back to 5 pips away from the sar dot or so (also this is a fib retracement to 50-61%) I can enter with a small stop and usually ride out 5, 10, 20 pips with small risk. And if the market is actually reversing then whatever, small loss, no big deal. The trouble I have with this strategy is in sideways markets. It seems to work exactly the opposite. In that when the sar sais buy you should sell and vice versa. This typically applies during Asian session leading up to European session. For the most part I just wont trade this market because of the unreliability. Or if I feel confident I will just scalp for 5 pips in the opposite direction of the sar using basic support and resistance levels. Ok that was my basic thoughts on this strategy. Oh yeah, one more point, lol, I use only the sar strategy but I have added daily pivots and find it an amazing strategy to look for reversals at pivots. I also use moving averages to avoid some false sells but can elaborate later if anyone is interested. The point of this post is that I hate sitting at my computer for hours and usually all night as I live in EST to watch for signals. Is there a way or an indicator that can alert me when the signals on the sar change? like in mt4 or something. any help with this would be greatly appreciated. I'm wondering if also I should set up a dedicated thread on this strategy as I have refined and refined it and have more than a few notes and screen shots on this strategy that could really help, incorporating pivots, candlestick analysis and how to use the strategy in sideways, trending, and news impacted markets? Submitted by User on November 24, 2009 - 18:16. Submitted by Edward Revy on September 29, 2009 - 10:06. 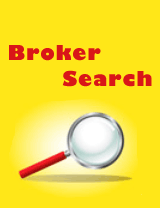 It can be done on charts from Oanda broker. However, it doesn't display MACD lines. Submitted by User on September 23, 2009 - 07:03.
pls how can i be able to place parabolic sar on MACD chart? Submitted by Edward Revy on September 21, 2009 - 04:06. They'll be different because a SAR on the chart will follow candlesticks, while a SAR on MACD will be attached to the Fast line of MACD.